Playgrounds.net Blog: How to Build Backyard Playground? Creating a private playground in backyard for kids is certainly not an easy job. But if you make the right moves, you can end up building a wonderful backyard playground for your children. Here are certain things that you must consider before acting upon your plans. Though size is not an issue for the parents who have large backyard but it becomes a matter of concern for the ones who own relatively a smaller one. 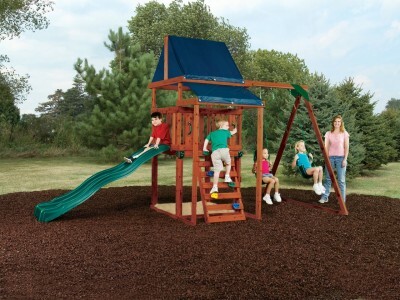 If you have smaller backyard, measure the area and the location where you want to install the playground equipment. By this, you will get an idea of what type of play sets you can purchase for your yard. Remember, you should leave a sufficient space between two sets to avoid any injury to kids. Consider the age of your kids. If you have toddlers at home you can select the plastic playground equipment like stumpy hollow, tube holes, short swings, play tunnels and climbing walls for them. But if your kids are school goers, select the play sets made of wood, metal or aluminum. Play tower, play house, dome climbers, trapeze are some of the equipment considered ideal for school goers. You can go for playground equipment manufactured by Swing-N-Slide and Gorilla Playsets, who manufactures them in accordance with Consumer Product Safety Commission (CPSC) and American Society for Testing and Materials (ASTM). Do not forget to install high quality mulch beneath and around the play sets to avoid the risk of any injury to your kids.